Ever been overworked, tired and felt muddle-headed? Research now shows honey bees suffer from the same thing – and we understand why. A honey bee's life is hardly relaxing. Every day forager bees make many trips, travelling long distances, to gather vital resources of pollen and nectar from flowers. They have to deal with predators, challenging weather conditions and the very real risk of getting lost. Just as chronic stress affects mental abilities in humans, our recent study suggests these stressful foraging activities reduce bees' ability to solve problems, by changing the connectivity between specific neurons in the brain. We studied the impact of foraging activity on bees' problem-solving skills by using radio tags to track individual bees. We tested foragers' ability to distinguish between different floral smells, which is essential to identify the flower species producing nectar or pollen in the environment. We then tested bees' ability to switch their preference between floral scents when the smell changed to indicate the presence or absence of food. This is important for efficient foraging because different flower species produce pollen and nectar at different times of the year. Honey bees also need to be working at their mental best to navigate between the flowers and the hive, otherwise they cannot collect enough food for the colony. Our study found bees that had been foraging for a long time or at high intensities were less able to learn new smells. We believe this might be due to stress. Stress in mammals causes similar learning difficulties, and another recent study described stressed bees as poor foragers. Foraging was particularly stressful for young bees, which seemed to be less resilient to environmental conditions. It was surprising that foraging had such a negative impact on bees, though, as it has previously been seen as a time for valuable mental training in a rich and complex environment. We also identified stress-induced changes in brain structure that affected learning ability. Intense foragers had more connections between the brain regions used for processing smells and a region involved in learning and memory. This raises the exciting possibility that future research may be able to predict problem-solving abilities simply by looking at a brain's structure. Honey bee decline – known as colony collapse disorder – is a global problem. We don't know exactly what's happening to Australia's bee population, but losses in New Zealand and the United States are well above sustainable levels. 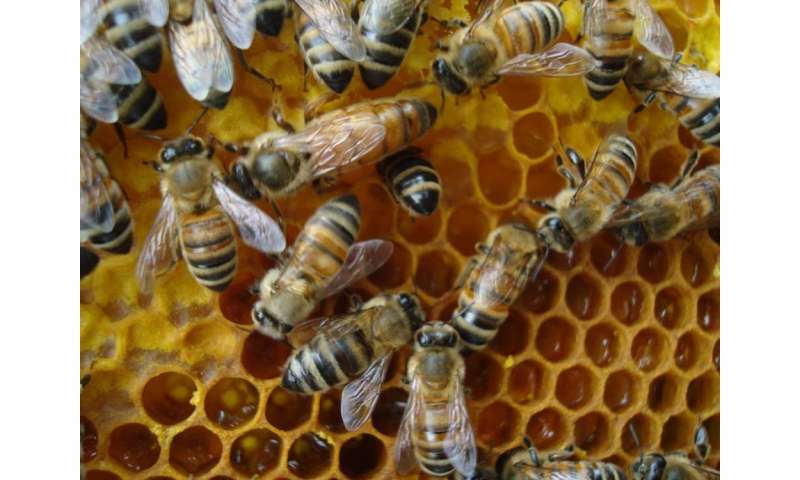 The contribution of bees to the Australian economy has been valued at A$100 million a year. Identifying the factors that cause stress to bees could help us manage and reduce their decline. We would do well to learn from the European Union, which has recently banned neonicotinoid pesticides that directly affect bees' brains. Looking forward, we could also develop simple tests for beekeepers to check the problem-solving abilities of their hives. This would help them identify weak colonies before they collapse, by spotting issues early and preserving the health of the colony.